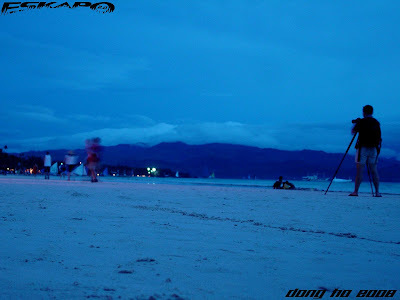 when the sun is down, one can still stay and wait for the display of the sky's shades of blue. it happens right after the golden sunset. 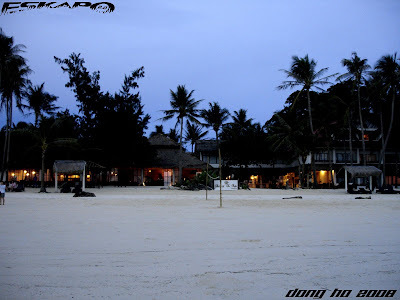 it is during this time when most people go back to their rooms and prepare for the island's night life. lights coming from the different resorts and restaurants begins to dominate. others would still stay as they swim without getting sunburned while people working around the island gets busier. but not many people would stay right after sunrise as they would usually be preparing themselves for the night's feast and party. the other way around, photographers enjoy this part of the night as it shows the island's beauty in a different shade. amazing shots dom. 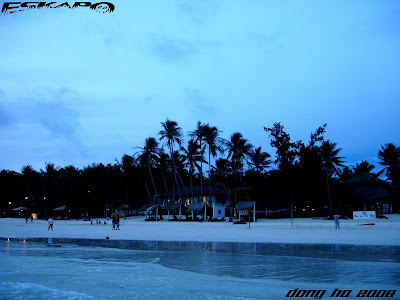 this probably is one of the best times in boracay - yung papagabi na. naglalabasan na mga tao nito at hudyat na malapit na maging party time sa beach. oh, i love that color too, right after the sun sets. it's all blue, no matter how slow you set your speed. and it's beautiful. makes me want to have a vacation more. hay. bora. >hi sheng, not really partying but i was able to walk till midnight. drop by coffee shops. it's indeed difficult to get around at night if you have kids with you. i too like those crepes. 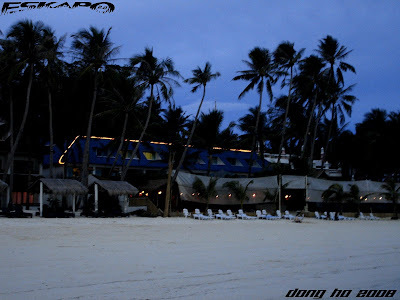 it' a hit actually in boracay. >oman, oo saya nga kumuha ng mga picture pag ganung oras. mahirap nga lang kasi wala akong dalang tripod. kaya challenging talaga ang mga kuha sa gabi. kakatuwa mga tao kasi yung iba lumalabas lang pag ganyang oras. >hi doc rio, hahaha... napa senti tuloy. sorry doc. >hi atticus, you're right. it's one of the best part of the day to point and shoot. >aethen, pwedeng pwede mo ng planuhin para sa summer next year. >borneo, yes it is. but you really have to look for places outside the main beach area if you look for a semi-private setting. wow!!! 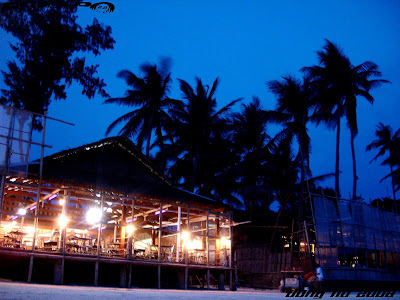 !the place so romantic,,look like my dream place to visit ..hopefully. i like this time of day, a period between sunset and dark. bora looks different in half-light. thanks for sharing this time of bora with us. Beautiful colors. I think I need a little vacay now. >kegler, hehehe... medyo bago nga ito. abangan namin yang black and white shot mo. hindi ko pa rin nasusubukan yan. >uncleawang, thanks! im happy that you like it. >hi vic, exactly. a lot of people usually miss to see this time of the night. >raft3r, salamat pero alam mo na talagang kahit anong kuha mo pag ganung oras makukuha mo pa rin ang ganda. >pusang gala, oo ganda talaga pero hindi ko alam kung doon lang sa panahong yon. >hi helena, you're right! but you need to pick some other place around the island for a semi-private place. >hi luna, my pleasure to share this and thank you. im glad you too like it. >photo cache, we'll look forward to that. 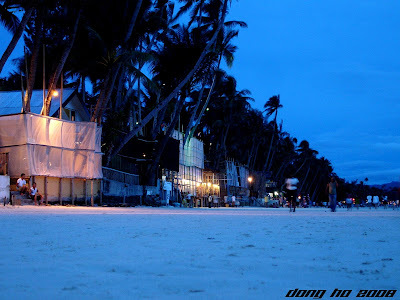 Hi Dong, do you think that night lights are more wonderful than sun light there in Boracay? It looks like it is more fun there on night time eh. oh wow lovely lovely lovely! so calm and serene ibang klase! 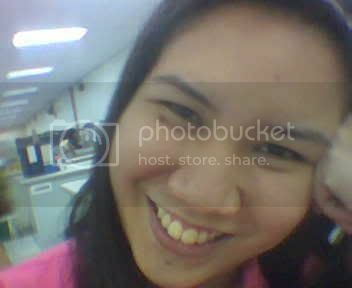 tsk...click! click! click! click! now. *salamat sa pagdalaw...xlink po tau? What beautiful shades of blue! It truly looks like paradise. Beautiful shades of blue, Dong! Talagang very inviting sa Bora huh? Hi!! Do you always visit the beach? Do you have a list of beaches to travel in the Philippines? wow!! Really amazing! 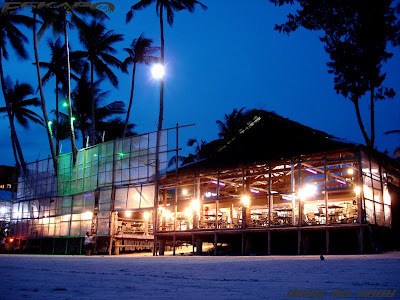 Can I invite you to contribute a short articles about the best beaches that you have visited in the Philippines and feature it at travelerfolio.com? Many people have been asking me about the Philippines but unfortunately, I don't have a chance to visit this beautiful country that soon. You will be the author, and the article will link back to you. Do let me know if you like the idea ok! Thanks! 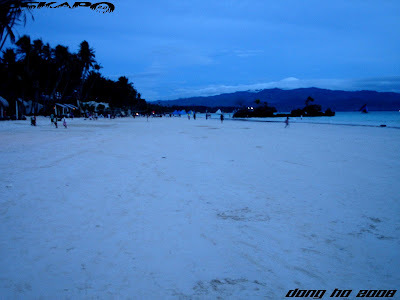 boracay - my favorite beach place. blue - my favorite color. Very lovely to watch what goes on after the sun set. It looked like a very fun and relaxing holiday for you. I am going on a one day trip to malaysia this weekend. Remember back home--so blue, so fresh, lot of fun, lot of love with the nature! So ito pala ang Bora when the sun is down? or mapili lang? Hmnn--so comfy to look at! Kailan kaya ako makapunta dyan. sa dinami dami ng mga litrato mo,nangangati na ang mga paa ko. The lighting here is wonderful. What a beautiful time and place. You can view the world differently night time. Beautiful placex excellent shots. You give us great ideas for our holidays! hayyy.. amazing talaga ang bora. wat kind of camera are you using, is it a SLR camera or any other brandd...? pls let me know abt the brand that you are using for snapshot..???? blue na blue nga. iba pala ang effect sa mata. cool na cool. hindi ko to nawitness. wow! first time kong makita ang bora nang ganito. ganta ng shade ng pics kuya dong. this is definitely one of your great sets of pics! galing! An amazing atmosphere of blue. Great photos! Boracay remains beautiful. Glad to know that it remains so many years after I first set foot there. Thanks for the pics! YOU HAVE BEEN TAGGED, please visit my blog site.... thanks! I enjoyed this series of blue photos. It's my fave colour. This image of Boracay is more preferable. I like the serenity that I once discovered here, but now gone. Amazing photos. The blue atmosphere is so beautiful. Wow ang ganda naman talaga sa boracay oh.. The best talaga.